The past year has been a wild ride of weather. There has been major tragedy, and it has been costly. Hurricane Michael was the second major hurricane of the 2018 season, and it was a history-making storm. Michael made landfall at Mexico Beach, Florida on Oct. 10 at a Category 4 hurricane. Winds were sustained at 155 miles per hour. It was the strongest storm to make landfall in the U.S. since Andrew in 1992. Hurricane Michael was also the third-most intense Atlantic hurricane to make landfall in the U.S. on record. This was behind the 1935 Labor Day hurricane and Hurricane Camille (1969). The storm devastated Mexico Beach and nearby Panama City Beac,h leaving both nearly unrecognizable. Roads were hard to decipher as sand was carried on shore with the storm surge and pieces of buildings were strewn all over the place in the destructive wind. Homes were flattened and some swept away. Thirty-five people were killed in Florida, but 60 deaths were eventually attributed to Michael when looking at previous damage in Central America and from the storms path as it continued inland in the U.S.. The exact final cost of Hurricane Michael is still being determined, but it will likely be one of 12 billion-dollar weather-related disasters in the United States this year. Hurricane Florence was another powerful, Category 4 hurricane in the 2018 season, but this one was unique in where it made landfall and how slowly it moved onto the coastline. This slow movement amplified the impact of flooding. Florence formed as a Cape Verde low and traveled across the Atlantic in the month of September, setting its sights on North Carolina. As it approached the coast, the storm, still at Category 4 status, slowed to a crawl and started inundating the Carolina’s with heavy rain. The storm only moved west at 2 to 3 mph and eventually made landfall as a Category 1 hurricane as it weakened. But the Category 1 status of this hurricane landfall doesn’t match with the true impact of this store. This is because of the sheer volume of water dumped by this storm. Portions of coastal North Carolina recorded more than 20 inches of rain over a 5-day period — some more than 30 inches total. That led to historic crests along rivers and cut off many towns from relief efforts because roads were impassable. The rain from Florence took weeks to make it through all the streams and rivers, so flooding not only occurred during the storm but lingered for a long time, making recovery efforts that much more difficult. Florence was another weather event of 2018 that will be a billion-dollar or more disaster. It actually ranks as one of the Top-10 costliest storms in U.S. history. It was a devastating year for wildfires in California. According to the California Department of Forestry and Fire Protection, nearly 8,000 fires were recorded this year burning more than 1.8 million acres of land. Increasing temperatures across the state and prolonged drought created favorable conditions. According to NOAA, July was the hottest month of record in California temperature history. The wildfire season really picked up momentum in late-July and August as the Carr Fire made national headlines, destroying 1,600 structures and resulting in more than a billion dollars worth of damages. That fire in northern California wasn’t contained until late August. According to the State of California, three firefighters died while responding to the blaze. Then attention shifted to fires like the Woolsey Fire and the Camp Fire. The Camp Fire is now listed as one of the deadliest in U.S. history after fast moving flames consumed Butte County, California in early November. 86 deaths are connected to the fire and the city of Paradise was practically destroyed by the flames. The rapid speed of the fire, fanned by 50 mph, prevented so many people from evacuating to safety. The Woolsey Fire was another one that garnered national attention as it burned through Ventura and Los Angeles counties. Hundreds of homes in Malibu were destroyed and more than 200,000 people were evacuated. It is estimated at more 1,500 structures were destroyed by this southern California fire. According to the State of California, three people did in this fire as well. This naturally, annually occurring phenomenon gained national attention when it hit epidemic status and the weather was a large factor to its growth in the summer of 2018. Red tide is a toxic algal bloom that kills sea life like fish, dolphins and manatees along the Florida coast. It technically happens yearly, but this year, a few weather factors have been blamed for it’s large growth and duration. Record-breaking rain fell over central Florida early in the summer season, bringing a rise to water levels in Lake Okeechobee. That is where algae also grew. Fertilizers from nearby farms also infiltrated the water body. That water had to be released to the ocean so widespread flooding wouldn’t occur in central Florida. But as that water, algae and fertilizer, entered the ocean, it interacted with the red tide and caused it to grow exponentially. Basically, the algae fed the red tide and made it worse. That combined with warmer ocean temperatures sustained the toxic bloom for months on end. Red tide first closed beaches along the southwest side of Florida’s coastline just south of Tampa, but as red tide slowly moved and grew, it eventually closed beaches farther to the north beyond Tampa and into the panhandle. According to Meteorologist Jason Adams of WFTS in Tampa, Florida, red tide is still present in the month of December along a few beaches but it is projected to subside in the winter months. Rainfall amounts made headlines over and over again during 2018, especially in the eastern U.S. Some of those rainfall records were associated with our two major hurricanes. But others were associated with very heavy rain producing events. According to Climate Central, 133 climate sites saw record precipitation totals this year, and 685 saw yearly totals that were among the Top 10 on record. 2018 is already the fifth-wettest year on record in the contiguous U.S. Specifically on the Island of Kauai in Hawaii, a rain gauge in Waipa recorded 49.69 inches of rain from April 14 to April 15. The highest rainfall record in a 24-hour period belonged to Alvin, Texas, where 43 inches of rain was recorded on July 25 to July 26, 1979. April is a common time of year for severe weather, especially in Tornado Alley, but 51 tornado reports in one day is significant. On average, 155 tornadoes normally happen over the MONTH of April. An explosive atmosphere setup was in place over Arkansas, Texas and Louisiana on April 13. Late in the evening, a cold front produced discrete thunderstorms and those storms quickly turned severe. EF0, EF1 and EF2 tornadoes ripped across the region as multiple waves of severe weather swept through into the early morning hours of April 14th. Additional rounds of severe weather followed on the 14th and 15th as the storm system moved east. Over the three-day period, 81 tornadoes were reported from Texas to Virginia according to NOAA. "Several of the tornadoes caused widespread damage, including an EF-2 that resulted in 12 injuries near Lynchburg, Virginia and an EF-1 that caused seven injuries near Reidsville, North Carolina," says NOAA. The Ohio Valley was inundated with heavy rain in the month of February. In Cincinnati, Ohio alone, 7.8 inches of rain fell in the month, most of which was concentrated in the last few days of the month. This was nearly 5 inches above normal. Previous wet soils and regional heavy rain meant that the water had to go somewhere, and that destination was the Ohio River. River levels rose to the highest levels since 1997. Cincinnati's Ohio River gauge crested at 60.53 feet, 52 feet is flood stage. But it wasn't just this city that saw substantial flooding along the river. Downriver in Louisville, Kentucky, the Ohio River crested 13 feet above flood stage — also the highest since 1997. 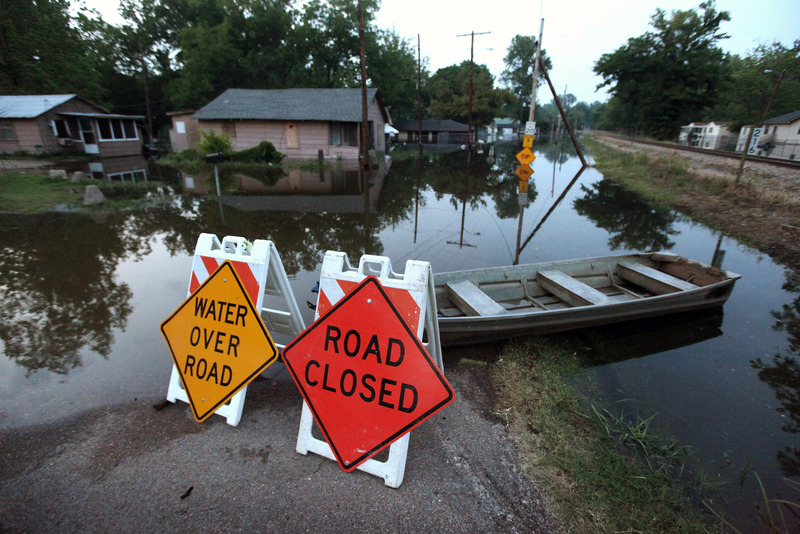 Due to the slow nature to river flooding, it took several days for water levels to rise and fall, damaging homes and other structures along this drainage basin. Hail isn't uncommon in Colorado, especially in June, but the hail that came down in June was significant. Three-inch diameter hail came down during a line of severe storms passed through on June 18, producing significant damage in the northern sections of the Denver metro. Cars were left with shattered windows and huge dents, homes were damaged and even golf courses suffered damage from the hail stones that fell at 40 to 80 mph from the sky. According to KMGH television station in Denver, the storm damaged cars and homes in the Boulder area, before moving northeast toward Fort Morgan, where 70 mph winds and baseball-sized hail wreaked havoc in Morgan County. To add insult to injury, the same area saw more severe weather the very next day including more hail and even a funnel cloud. A crippling snowstorm hit the southeast Dec. 8-10. While heavy snow in this portion of the county isn't out of the question, the amount of snow so early in December brought the region to a halt. This system actually started dumping heavy snowfall in northern Texas first. Lubbock recorded 10 inches of snow on Dec. 8. As the system approached the Appalachian Mountains and the effects of cold air damming, snowfall starting falling at much higher rates over Virginia and North Carolina. Snowfall amounts we staggering in some places, especially at the higher elevations. Mount Mitchell in North Carolina, which is the highest elevation in the eastern US, received 34 inches of fresh snowfall. It was 2 inches shy of the all time record. Cities such as Roanoke, Virginia received just more than 15 inches of snowfall, the third highest in recorded history during December. Raleigh, North Carolina picked up 11 inches of snowfall. But it wasn't just snow — others picked up significant ice with this system including portions of Arkansas, Tennessee and Missouri. The impact of this storm lingered even beyond the initial snowfall as snow melted and refroze overnight as black ice, causing extended travel woes. This story was written by WCPO meteorologist Jennifer Ketchmark for The E.W. Scripps Company and its affiliates. Follow her on Twitter @KetchmarkWCPO .